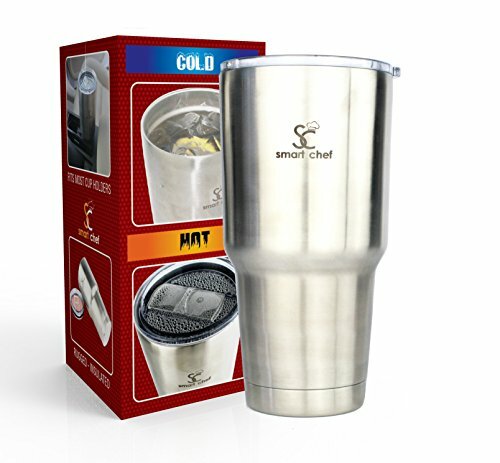 Stainless Steel Insulated Vacuum Tumbler 30 Oz 76% Off TODAY ONLY! PRIME WEEK OFFER (till Sunday evening)! Advanced double-walled insulated vacuum maintains constant beverage temperature for hours without attracting condensation. Enjoy your coffee at its optimal temperature and freshness for hours! The tumbler does not sweat, so no coaster is needed to protect your furniture. Welcome to TUMBLER HEAVEN! PRACTICAL! Holds a whopping FIVE coffee cups of liquid! Tapered base fits most cup holders. Take your coffee on the road, whether commuting or traveling. And it's top-rack dishwasher safe so cleaning is a breeze! NICE! BEAUTIFUL food grade leach-resistant BPA-free #304 stainless steel is good for your HEALTH. Plus, its polished shiny surface will handsomely complement your kitchen decor. CHIC! INTRODUCING! Special twist-n-seal splash-reducing sliding lid allows one-hand operation while helping you to avoid leaks & spills. Open or close crystal-clear lid with the flick of a finger. CONVENIENT! NO-HASSLE LIFETIME GUARANTEE: Enjoy Smart Chef's legendary Lifetime Warranty. You love it, or your money back! No questions asked. Customer service is our passion! GRAB THIS DEAL!